Sorry, I have been away for so long! Can't believe that a week has passed! It's getting harder and harder for me to sit at my computer! 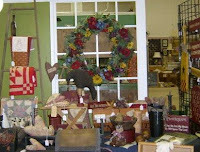 Just too much to do...I have been putting every spare minute into the Market Place Booth and my booth at Just Plain Country in Walnut Cove. Here are a few random pictures from the new booth. It's really coming together for us. Deb found the old swing and it's perfect for dolls and pillows. 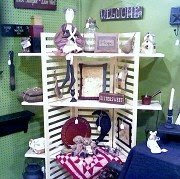 Retha brought in old shutters over the weekend that are wonderful....would be perfect in a prim corner. Table stocked with everything prim! Old swing with dolls. It's kinda hard to see all the goodies, but it is definately filling up! Pegboard wall with a little of this and that! Other side of booth with a table Full! There's really a fantastic variety there now. And we are having our first ever Spring Giveaway. We were asking folks to guess how many jelly beans in a jar, but someone actually opened the jar and helped themself to some of the beans, so I suppose it will just be a drawing! Too funny!! The prize is a handmade pillow with Spring Tyme stitched on it with pastel homespun borders. No purchase necessary to enter, so if you're in the area.....be sure and enter. Bookcase with goodies and handmade signs. Be back soon with some pictures to share. It has been an almost perfect Sunday in K-ville. 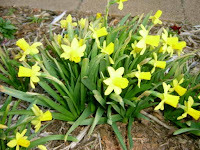 The birds are singing, the sun has been shining and the temperature has been in the 60's. The kind of day where you almost have to be outside, at least a little bit. I sat out with Mr. Ruffie for a short time and Bill put a huge bag of fertilizer on the lawn. We have been in and out, here and there for most of the day. Now, I need to think about what to make for dinner. Something quick and easy....maybe soup ( I have some homemade vegeatable beef soup in the freezer), sandwiches and chips. We had a pretty big breakfast at the local diner and for lunch I made a roast with mashed potatoes and tossed salad. So, I think dinner can be skimpy for us this evening. Tomorrow promises to be another busy day for me. (And I am so glad!) I already have my To-Do list made up and ready to go. I know it's been a while since I have been around, but it has been a kind of a screwy week for me.....the rain came and stayed and stayed and stayed, Bill has been feeling poorly, Cait still hasn't found a full time job, I have several orders to catch up on and I have just flat out had a pity party, I think???? I read on a blog the other day about how all this should be fun and not to feel pressured in to posting everyday so...I took it literally. Sometimes, I really don't have the time and sometimes I just get tired of the computer and have step away for a few days. I think that is what happened this week. So, finally yesterday, enough already and I took the day for ME. I went shopping, got a couple of new tops, got my hair trimmed and found a few things, including a stitchery and a cute little water pitcher. It helped tremendously!!! Got up today with a whole different attitude and had a very, very productive day. Bill and I went to Walnut Cove AND to the Market Place in Greensboro, (took room sprays plus a few other things) had a fabulous lunch together and EVEN did a little shopping together.............But, enough of that. This is what I want to share today! Bill and I spent yesterday at the Drs. office. This time with him getting a cat scan. He has been feeling poorly since he had the flu in late January. In all of our years together, I can count on ONE hand the times he has been sick. I am little concerned, but I am trying not to worry too much. 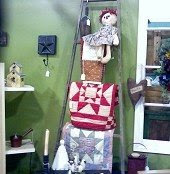 I've had a good week on my web site and most of the OOAK sale items are gone, as well as the Old Quilt Gathering. I'll be adding a few new things on Monday or Tuesday, so be sure and check back. This might be a good time to Thank you all for following my blog and signing my guestbook at the bottom of the page. I recently realized that have been quite a few folks that stopped by to say Hi! It's a warm, fuzzy feeling to know that so many take time out of their busy lives to let me know they have been here. I think it's neat and I appreciate it. And by the way, every time you comment, I enter you in my monthly web site contest!! I'm gonna try to do some stitcheries, so that's all for now. I'll be back soon. Today, I am sharing a couple of things that you might have seen before.........several months ago, I found this wonderful crock at the Rusty Bucket in Apex and have never done anything with it. It has been sitting in my extra room doing nothing! I was sitting at my computer the other day and decided it would be really nice in the foyer at the front door. It's such a lovely crock and I would love to have a few more...anyone out there in blogland sell this style? I already had the greenery with little burgandy berries and it fits perfect in the corner. And finally, I have been wanting to do the top of my refrigerator for weeks with something a little different. This is what I came up with for now. Most of the stuff I already had including the decoupage print that coordinates with my border. The other treasures came from other locations throughout my house. It actually looks pretty good in person. That's about it for today...on a different note, we didn't get the freezing rain, but we did get the freezing temps. I had a really hard time getting my rear in gear today! 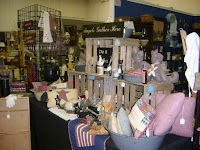 Lots to accomplish this weekend, including getting over to the Market Place to take some new goodies! Wish you all could come and see! Where has this week gone? I had so many plans and to be perfectly honest...lots of stuff just ain't gonna get done this week!! LOL!! I think I need to organize my time a little better. Hubby was out of town for several days and I usually get soooo much done when he's not here, but not this time. Maybe, I'm just getting old. I had seen this lovely stitchery on her blog and fell in love with it. Being the obviously Sweet person that she is, offered to get one for me and send it to me! So this was the start of our trade. She chose the set of Shaker Boxes from my site. But, I had no IDEA that she would go to the trouble of also including the fabulous little BIRD! and the note pad! How did she know that I absolutely adore birds and was so excited to get this one. A perfect trade for me!!! I love, love, love everything! 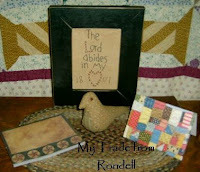 Thank you so much, Rondell!!! The note pad is too cute....and the note was so sweet! I would love to go shopping at the Country Store where these goodies came from! I put the stitchery and the bird on my crock bench at the front door. Everyone can see them when they walk in my foyer. Whoever did the stitchery, did a beautiful job on it! Very impressive ! 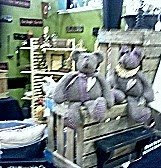 Another couple of little updates to share..........our new booth at the Antique Market Place is doing sooo well! I couldn't be more pleased for no longer than we have been there. Retha and Deb are also happy with the sales. I have a feeling that we are going to stay pretty busy keeping the booth stocked the way it should be. Right now we have holes every time we sell something, you can tell things are missing. (Too funny) It's pretty full now, but they keep telling us to have it packed. 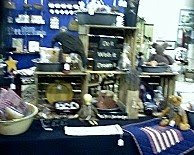 And my booth at Walnut Cove is doing fabulous since their re-opening last Saturday!!! Praise God! I really wasn't sure how they would do after being closed for 4 months. But, apparently they still have their customer support, which is great in these horrible economic times. I'm getting up early tomorrow and catch up on my blog reading! Just haven't had much of a chance so far this week..............How do you other guys do it??? I see some folks that have a blog list that goes on and on. How do you have the time to follow them all? I wish I could figure it out. Another Spring-like day in K-ville! I just love it...I get so much done on days like this. I had several projects in the garage and outside today. The perfect day to paint, a little harder to stay in and sew. I have a couple things to share........I have added several new goodies to my web site today. 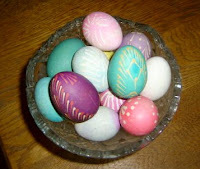 One in particular is a gathering with several different prim items. A terrific buy at $ 16.99! Gotta run for now, but I'll be back soon! I picked up these little dresses the other day when I was at the Antique Mall. They are just too CUTE! Just couldn't pass them up. A few shots of our booth...taken with my cell phone. Retha's going back today with her camera. Gotta get back to work on some orders ...and then I'm trying to catch up on some blogs today. I haven't read any in DAYS and I'm missing out. I worked on orders bright and early this morning and then decided to re-do the little dress that I offer on my web site. It's still very similar, but I felt I needed to change it a bit. The skirt part is much longer, the hanger is now a stick and there's only one button on the shortened bodice. I am pleased with the changes....it's quite grungy and prim, perfect for a peg or nail. Grungy tea dyed muslin Prairie Dress is about 27 inches long. 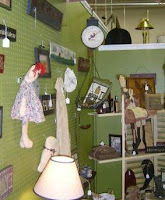 Tomorrow, we ( meaning Retha, Deb and me) are moving into our booth at the Antique Market Place! I am very anxious about it...there's a lot riding on this for me. This is what I have been waiting on for sooooo long and now we're finally doing it! I'm hoping that we can get a lot done tomorrow, but it will take several days to get it like we want. I also have to run to Walnut Cove sometime before Friday. They want us all to come and straighten our booths and pick up the Christmas items that we have. I was there the day before the collapse, so I shouldn't need to do much, except pick up the Seasonal and maybe drop off a few Springy items. I'll be back soon, but until next time. SnoW, sNoW, SnOw, oh my! This is what we woke up to this morning. It started around 8 pm last night and was still snowing when I went to sleep around 1 am. We haven't had this much snow in K-ville in a long, long time. We won't be going anywhere for a while, so I'm going to start crafting in a little bit. 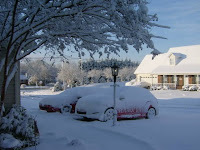 Cars covered in driveway. Trees covered in side yard. Back yard is covered. Patio table too. 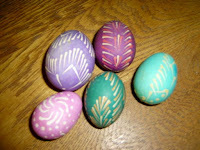 Amity has already called and the kids are getting ready to go outside and play. It usually takes 45 minutes to get them dressed for 5 minutes of outside time. LOL! She used to love to play in the snow when she was younger. This reminded her of our old Chicago days. On the first day of March, we are getting SnOw! This is one of the things I have made today...I love, love, love birds and have been wanting to make one for me for a long time and just haven't gotten around to it. But, I saw this one yesterday from Rock River Stitches and fell in love with it. I had to have the pattern and got started on it right away. It turned out pretty good, I think. Dark blue calico bird pin-keep with painted felt strawberry. Here's another one of my projects for this week. I finished up the prairie doll yesterday to use with my re-designed bowl shelf. I decided to put a painted plate, berries and some of my spools in it for a while. Right now, I have it sitting on my little black table instead of my kitchen counter. Not sure where it will end up, but I like the looks of it, so I'll find a spot for it. Walnut Cove is scheduled to re-open March 7th, 2009. We can move in our NEW craft booth anytime now. I gotta run for now....Brothers and Sisters is coming on and it is a special 2 hour movie tonight.